You’ve passed the general store, wound through the tight s-curves next to the bay, and climbed the short sharp hill after the waterfall. You drive your legs into the downhill slope, pushing the pedals as hard as you can. The wind whistles through your helmet, and your momentum carries you up and over the next hill, where another stunning vista of a sparkling blue lake awaits. This is road biking in cottage country. When retreating glaciers carved the lakes out of the Canadian Shield, they left a landscape difficult to cross on foot. When roads were eventually built, they ringed the shores previously only accessible by steamship, connecting the cottages and resorts. This left roads that are undulating ribbons of pavement following the lakeshores, rarely straight, and rarely flat. With thousands of water bodies dotting the region, this means that there are hundreds of kilometres of twisting roads just begging to be ridden. 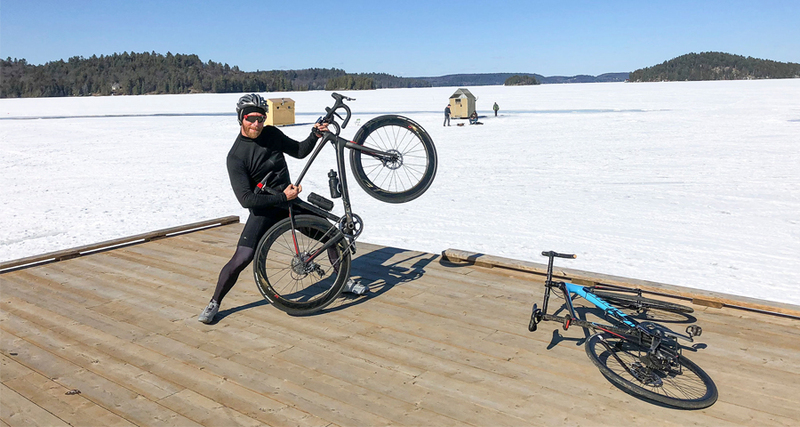 Cottage country is truly a road biking paradise, with minimal traffic on wonderfully winding roads, friendly faces and places to stop in a multitude of small towns and villages, and challenging terrain that will get you in the best shape of your biking career. By the numbers, cottage country is comparable to the elevation differences you’d see in the Alps – every kilometre travelled means about 10 meters of ascent, due to the countless grinding hills. My favourite route is the loop around Lake Rosseau, one of the three “big lakes” in the Township of Muskoka Lakes. 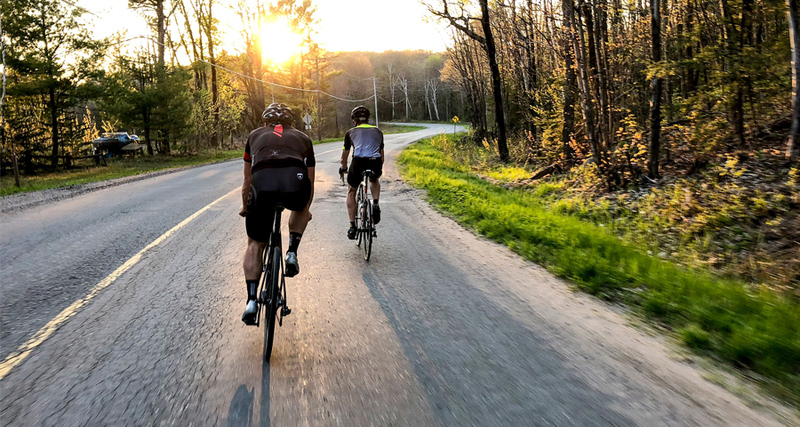 At 65 kilometres with 1,000 meters of climbing, this loop will leave you breathing hard and perhaps in need of a rest day the next day – it’s definitely a route for experienced cyclists (check out more routes featuring Lake Rosseau here too). 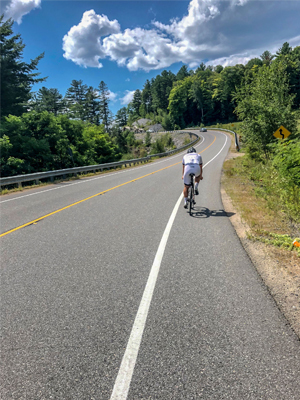 Beginning in the bustling village of Port Carling, you start out on a few narrower, less travelled roads with short steep hills, then onto Highway 141 ( a designated “Scenic Corridor” in the province), which offers more ample shoulders. From there, pedal your way into the quaint village of Rosseau, where you can stop for a refreshment at one of Canada’s oldest operating general stores, the Rosseau General Store, at a couple of quaint coffee shops, or to dine at Crossroads Restaurant, one of the most popular eateries in the region. 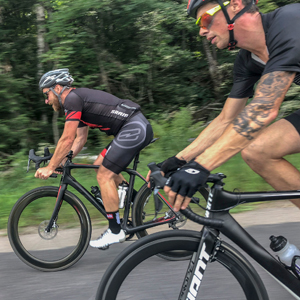 Moving on from Rosseau, take a hard left (heading south-west) onto Highway 632, one of the most exhilarating roads in the region, with corners that let you feel the g-forces pulling and a couple of descents where you can get speeds you see on the televised European tours. This is also the heart of Muskoka’s resort industry, so plan your stay at the JW Marriott The Rosseau, Clevelands House, Shamrock Lodge, or Sherwood Inn. Before you cross the one-lane, picturesque swing bridge at Port Sandfield (stop for ice cream and famous blueberry donuts at the country store), you can make a slight detour into the hamlet of Minett, which features a summertime pop-up village at Summer Water Sports, ith a boathouse yoga studio, boutique shops and a bakery in a converted church that serves incomparably gooey butter tarts. 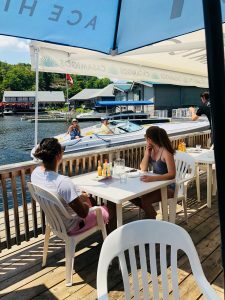 After a few more kilometres, you’re back in Port Carling, “The Hub of the Lakes,” where a cold beverage and a well-deserved meal await at a range of lakeside restaurants. Tacos, anyone? Further south, the terrain is a little more mild, but there are some incredible options for long hours in the saddle. From Gravenhurst, head east on Doe Lake Road. Further east are the sparsely populated pioneer settlements of Germania and Uffington, and you can loop around and back to Gravenhurst on a number of narrow roads. Out here, chances are good that you can travel the length of a road without seeing a single car. If you’re looking for a longer route – 100km plus – head south on Housey’s Rapids Road, then west on Southwood Road. This tour will take you through the Torrance Barrens – a mystical and beguiling landscape that features perfect blacktop perched on pink granite. Back in Gravenhurst, be sure to make a stop at The Bakery – apple fritters the size of your head, and glazed donuts of all flavours will replace the calories you just put out in a hurry. A bit further north, where the towns are fewer and further between, there is tremendous opportunity for some “best day ever” long rides. This past summer with a couple of friends, I put in a 200+km day out through the Almaguin Highlands that we’re still talking about months later. Head out of Huntsville on Ravenscliffe Road to Sprucedale (35kms), onwards to Orville (another 35kms), across to Dunchurch (45kms), a little south to Burk’s Falls (40kms) then back to Huntsville (60kms). Days like this mean you can be a complete glutton when it comes to lunch time – on our big day out, we each enjoyed a family-sized poutine at the Ahmic Harbour chip truck. Another great northern option is the ride out into Algonquin Park from Huntsville on Highway 60. Wide shoulders make for pleasant and speedy riding, and chances are pretty good that you’ll see some amazing wildlife along the way. Each of the big towns features a fantastic bike shop for all of your gear and repair needs, and should you find yourself stranded because of mechanical issues, locals and cottagers alike are exceptionally friendly and always willing to lend a hand or a lift. There are a number of organized charity rides throughout the summer, cycle touring events, and a number of local bike clubs that have weekly organized rides as well, if you’re looking to get out with other people. If you’re planning a bike trip in cottage country, be sure to make your first stop www.bikecottagecountry.ca – you’ll find a wealth of information about routes, accommodations and other things to see, eat and do while you’re here. See you around the lakes! 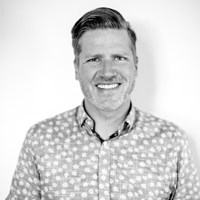 Scott Turnbull is a professional photographer in Muskoka and an avid on-road cyclist. You can visit him and his jewellery-designing wife, Miranda, at their studio in Windermere, Ontario.